A local Chavacano name given to this sea crab species that is uniquely found in the waters around Zamboanga, and no where else in the world. It is popularly described as a highbred crustacean, with crossbreed characteristics of a large sea crab and the big spiny lobster. 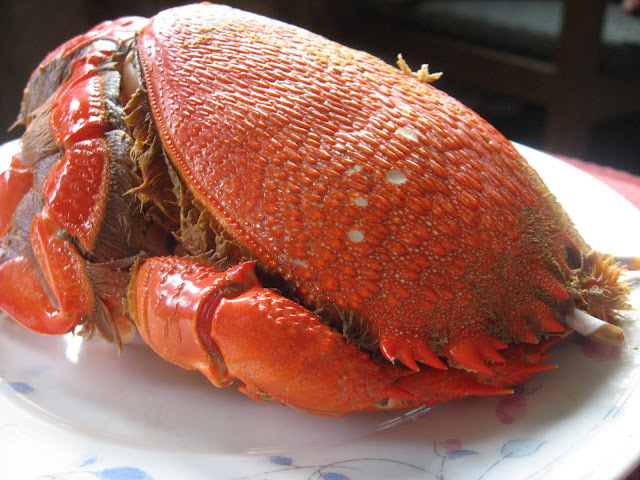 Thus, it is unusually large [reddish-pink in color] for a hybrid crab and quite meaty, and oh so delicious! A special Zamboanga City treat. 1 Wash Curacha. Place in cooking pot. 2 Steam or boil in plain water, until cooked to desired level. 3 Serve with steamed rice and fresh Latu (seaweed/sea grapes) or salad. *Curacha is best experienced in its natural exotic flavor, cooked minimally so as to preserve its original taste.